The MTA said it was launching a full investigation into the problems and apologized to commuters for "letting you down"
Straphangers took to social media Thursday night to vent about a hellacious evening commute on the F and G lines, with some reporting they were stuck in between stations for nearly two hours. The MTA reported about 6 p.m. that no G trains stopped running along the entire length of the Brooklyn-Queens line, with F trains running along the D and C lines in Brooklyn because of a defective piece of equipment at the Bergen Street stop that shut down signaling for both lines. Those issues were compounded, the MTA said, by passengers who were hit by trains on the 7, R and D lines around that time. The MTA said that it had restored G service between Court Square and Bedford-Nostrand Avenues by 9 p.m. and had filled out the rest of the line with shuttle buses and F train service. But it came too late for thousands of commuters who faced hourslong commutes for some straphangers who rely on the lines to reach parts of Brooklyn that don't have other subway service from Coney Island all the way to Greenpoint's northern tip. 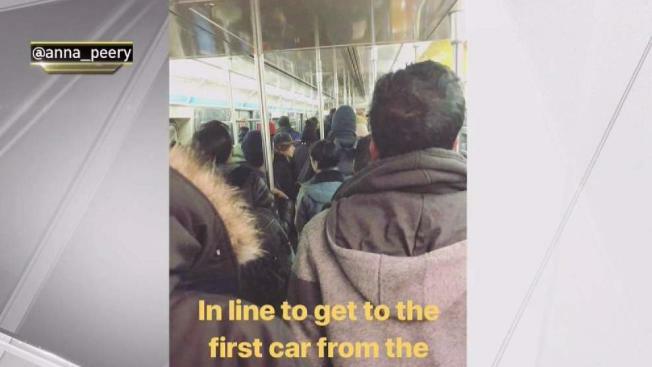 Commuter Anna Peery posted a call for help on Twitter about 7 p.m. on Thursday, saying that she and fellow G train riders had been stuck between the Hoyt-Schermerhorn and Bergen Street stations for nearly 2 hours. In one video tweet, an earsplitting buzzing noise can be heard from outside the train; she later said the sounds lasted for 5 to 7 minutes at a time. "Houston we have a problem!!!! Stuck on the g train for almost two hours now like it’s the new home I never asked for," she said in one tweet. Peery said the Church Avenue-bound train was eventually backed up to the Hoyt-Schermerhorn stop, where video she posted shows other commuters slowly walking through the train to get off through a single exit. Peery can be heard letting out a whoop when she finally makes it off the train. Others posted pictures to social media showing commuters crowding around the mezzanine at the Court Square G stop in Queens, with the platform packed with frustrated straphangers. And the delays made true the supermarket magazine adage "stars: they're just like us!" "The Big Sick" actress Zoe Kazan vented on Twitter that she waited nearly an hour for an F train to Brooklyn before giving up and taking a cab home. hey @MTA i just waited almost an hour for an F train to Brooklyn before giving up & taking a cab. at rush hour. Below are tweets from other straphangers stuck by Thursday night's signal problems.